Heading out the door to catch a plane, like many busy working moms, I stopped on the front steps and went through my mental packing checklist. Airplane tickets were in my briefcase, as was my trusty little technology bag. Arriving at the airport 45 minutes later, I discovered one of my most important travel tools was missing. I had left my AT&T Unite plugged into its charger, forgetting to pack it in my tech bag. Public and hotel Wi-Fi can be unreliable and lack proper security. Time for Plan B.
I decided to jot down some notes and write the blog post later at the hotel. Arriving at my destination several hours later, the slow and spotty hotel Wi-Fi forced another change of plans. I quickly acknowledged that my writing, like many day-to-day tasks, depends on access to online research and I was starting to hyperventilate, thinking of missed work deadlines due to poor quality connectivity. I longed for my mobile Wi-Fi device on my desk back home, realizing just how dependent I am on that small piece of electronics and how confident I felt with it in my briefcase. Now whether I am heading out to work, meetings or business trips I review my technology travel list before heading out the door. Here’s my technology travel list – what on your list? 1. Tech Devices: I usually bring my laptop with me on business trips but powerful tablets may change that habit. I also bring other devices such as a video or digital camera depending on the event. 2. Smartphone: It’s like one of the family. 3. Backup charger: My favorite is a universal charger that works for both my laptop and my smartphone. 4. Mobile WiFi: Uninterrupted work on the go requires connectivity. The AT&T Unite (powered by Netgear) not only gives me a secure network but it also has a battery life up to 10 hours, which is enough to get me through my day. 5. 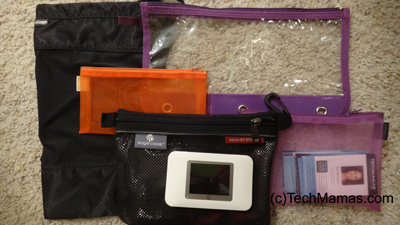 Travel Cases: Keeping technology like chargers, cords and memory organized is essential. I have a stash of different zip cases and travel bags with zippers to store technology within my laptop bag and stay organized on the go. One case contains power cords, another has my smartphone, mobile Wi-Fi, backup battery and digital camera. A final small case holds my extra business cards. In my purse I also have items separated in zip cases. One case contains my lipsticks and face powder. Another case holds odds and ends like mints, pens, bandages, pain relievers and basic travel items. For trips require a large amount of technology (such as the Consumer Electronics Show in Las Vegas), I put my devices in separate cases with their chargers and accessories. Or sometimes I put all of my technology accessories in a few cases of their own. 6. 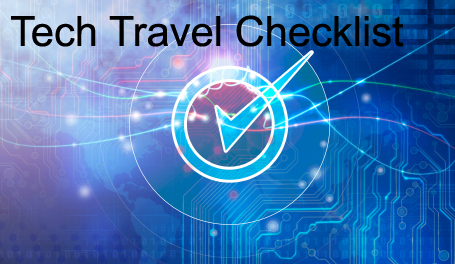 Travel Documents: As a backup, I have paper printouts of key travel and work information I need on the business including hotel reservations, driving directions and meeting agendas. 7. Memory: Even though I store my documents in the cloud, I like to bring an extra flash memory cards (if I bring a camera) and USB Flash drive. Having a second copy of my presentation on a flash drive gives the comfort that if something goes wrong I always have a backup copy. But there is something ironic about having “memory” as a step in my checklist to remember what to bring to business trips. 8. Power Plug: I find that many hotels do not have enough plugs to charge up my tech each night. So I travel with a plug that has three outlets and two USB slots and that plugs into one wall outlet. Of course, if I am traveling in a different country, I bring the international plug. Disclosure: This is a sponsored post. I received an AT&T Unite as part of my sponsorship. My words are my own. For more information, visit att.com/Unite or connect with WiFi Family on Facebook.